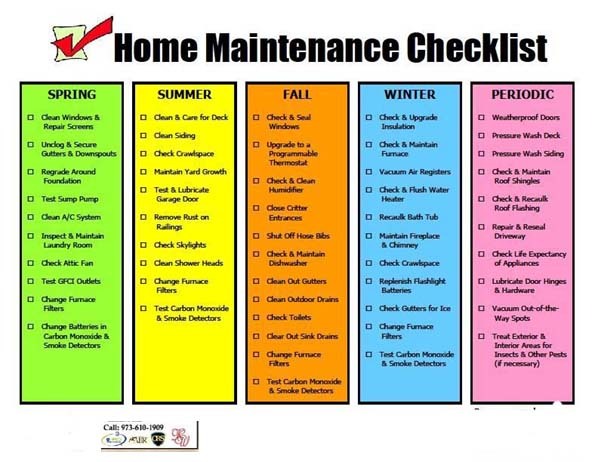 Prevent tomorrow’s problems with ourmonth-by-month chart of tasks for your home. • Fire Extinguisher: Checkthat it’s fully charged; recharge or replace if needed. • Sink/Tub Stoppers and DrainHoles:Clean out debris. • Garbage Disposal: Flushwith hot water and baking soda. • Water Softener: Checkwater softener salt drum and replinish salt if necessary. • Forced-Air Heating System: Changefilters once a month if user’s manual recommends fiberglass filters. • Range Hood: Cleangrease filter. • Tub Drain Assembly: Cleanout debris; inspect rubber seal and replace if needed. • Floor and Outdoor DrainGrates: Clean out debris. • Smoke Detector: Testbatteries and replace if needed. • Toilet: Checkfor leaks and water run-on. • Interior Caulking: Inspectcaulking around tubs, showers, and sinks; replace any if it is deteriorating. • Forced-Air Heating System: Changesemi-annually if user’s mannual recommends high efficiency pleated orHEPA-style filters. • Garbage Disposal: Tightendrain connections and fasteners. • Clothes Washer: Cleanwater inlet filters; check hoses and replace them if they are leaking. • Clothes Dryer: Vacuumlint from ducts and surrounding areas. • Wiring: Checkfor frayed cords and wires; repair or replace them as needed. • Range Hood: Washfan blades and housing. • Roof: Inspectroof surface, flashing, eaves, and soffits; repair if needed. • Gutters and Downspouts: Cleanthem out or install no-clean version. Inspect and repair weak areas; check forproper drainage and make repairs if needed. • Siding: Inspectand clean siding and repair if needed. • Exterior Caulking: Inspectcaulking and replace any that is deteriorating. • Windowsills, Doorsills,Thresholds: Fill cracks, caulk edges, repaint; replace if needed. • Window and Door Screens: Cleanscreening and repair or replace if needed; tighten or repair any loose ordamaged frames and repaint if needed; replace broken, worn, or missinghardware; tighten and lubricate door hinges and closers. • Gutters and Downspouts: Cleanout. Inspect and repair weak points; check for proper slope. • Chimney or Stovepipe: Cleanflue (more frequently if needed); repair any cracks in flue or any loose orcrumbling mortar. • Storm Windows and Doors: Replaceany cracked or broken glass; tighten or repair any loose or damaged frames andrepaint if needed. Replace damaged hardware; tighten and lubricate door hingesand closers. • Window and Door WeatherStripping: Inspect and repair or replace if it is deteriorating or ifit does not seal. • Thermostat: Cleanheat sensor, contact points, and contacts; check accuracy and replacethermostat if it is not functioning properly. • Outdoor Faucets: Ifyou live in an area with freezing winters, shut off valves to outdoor faucets.Open spigots and drain, store hoses. • Septic Tank: Havea professional check the tank (watch for backup throughout the year). In manyareas, it is recommended that the tank be pumped every year. • Main Cleanout Drain: Havea “rooter” professional clean out the main line, particularly ifthere are mature trees in your yard whose roots could have cracked the pipe intheir search for moisture. • Water Heater: Drainwater until it is clear of sediment; test temperature pressure relief valve;clean burner and ports (gas heater). • HVAC System: Havea professional tune up your heat/air conditioning system. Maria Scors, ABR, CRS, CDPE,ePro Internet Certified! SAVED THIS FOR YOUR FILE!!!!!!! Follow Maria Scors, REALTOR®, ABR, CRS,CDPE, ePro Internet Certified!